Glow Galaxy Norcross has an amazing glow in the dark play area featuring a variety of play activities. All of our games are designed for the glow in the dark environment, we have the world's only glow in the dark inflatables. We offer a variety of activities to keep the party fun and interesting throughout your play time. Glow Galaxy features the world's only Glow in the Dark inflatables. There are six inflatables in our play area: giant two lane slide, two 50' long two lane obstacle courses, bounce house, obstacle course/tunnel/slide combo, and our air cannon shootout game. Glow Galaxy features a nine hole Glow in the Dark miniature golf course. Our multi-sport sports court is a 45'x25'netted in space. The sports court features two full size adjustable height basketball hoops, soccer nets and Glow in the Dark basketballs, footballs, and soccer balls. Glow Galaxy also offers a lighted interactive projection game floor, where kids play games by moving around in the lighted space and a three hoop basketball pop-a-shot game. In addition to the games and activities listed above, kids love to play classic games like hide ‘n seek, tag, and others when they’ve got all their friends in one spot. 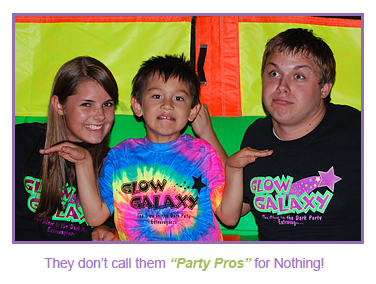 Our party pros are experts in a variety of these games and a couple of Glow Galaxy specials. Both arenas offer open space for games of tag, hide and seek, etc. Glow Galaxy offers a variety of activities in our glow in the dark play arena to ensure that your guests don’t tire of the activities. We want to be sure that they run out of time before they run out of interest in our games. All of the games in Glow Galaxy are included with admission; you can leave your quarters at home. The play arena is heavy on glow in the dark effects with fluorescent carpet, fluorescent painted walls, numerous glow in the dark statues, and the glow from the games themselves.